Watch and play TV and movies from Hulu. Is there a better alternative to Cinema for Hulu? Is Cinema for Hulu really the best app in Entertainment category? Will Cinema for Hulu work good on macOS 10.13.4? Cinema for Hulu needs a review. Be the first to review this app and get the discussion started! Cinema for Hulu needs a rating. Be the first to rate this app and get the discussion started! Cinema for Hulu allows you to view Hulu videos in an HTML5-compliant video player without the need for a web browser -- no Flash required. Simply open the app, login, and you're good to go. 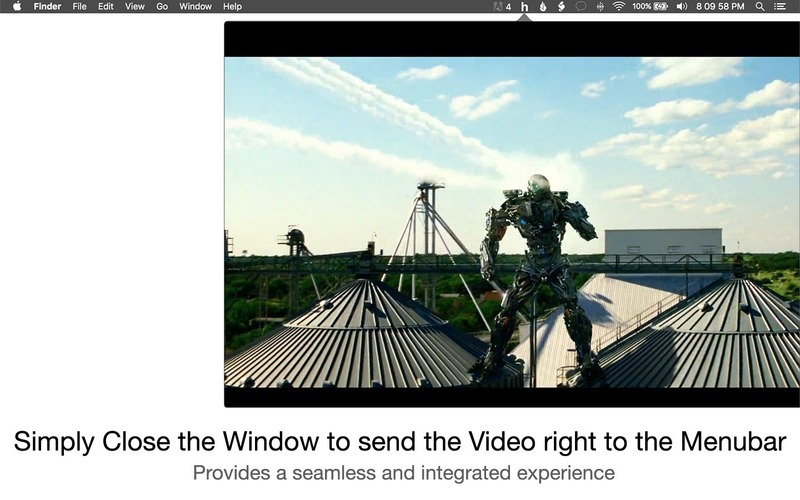 In addition, it provides a unified and integrated experience: controls seamlessly fade in and out, control the application right from the menu bar, and closing the desktop window will send Video right to the menu bar! 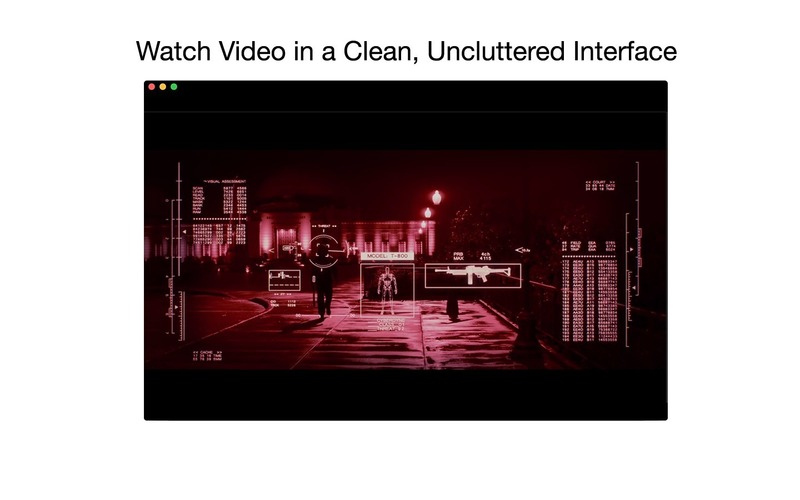 Cinema for Hulu lets you float the video above all other windows (so you'll never miss a moment), and you can set the transparency to give an experience far superior to that of a Web browser. It also features instant search right in the toolbar, where you can search for TV shows, movies, actors/actresses, genres, and more! 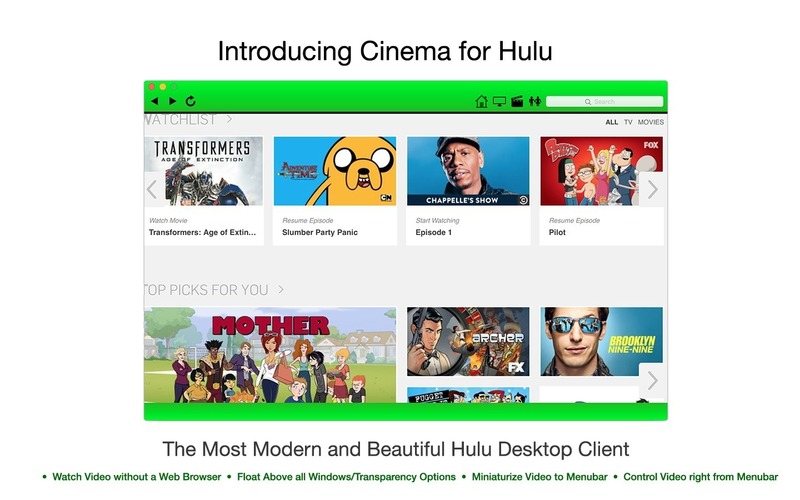 With all these features, plus a sleek interface and modern foundation, Cinema for Hulu fits macOS like a glove, and offers the best video-viewing experience on any platform! Note: A Hulu subscription is required; Cinema for Hulu is a third-party application, and is not in any way endorsed, affiliated, or promoted by Hulu Inc.